Following last weeks debacle, the NYPD was once again in Boro Park towing vehicles for a wide-range of violations. Tow trucks were seen towing vehicles in quite a few locations from no standing zones, fire hydrants, no parking anytime, and bus stops. This time, there were no bystanders screaming at the tow trucks. It should be noted that most of the vehicles towed owe thousands in outstanding parking violations. Many took to social media to warn residents about the tow trucks in the area, with many blaming the crackdown on parking violations as a “revenge” by authorities after the way an NYPD Traffic Agent operating a tow truck was treated by bystanders. 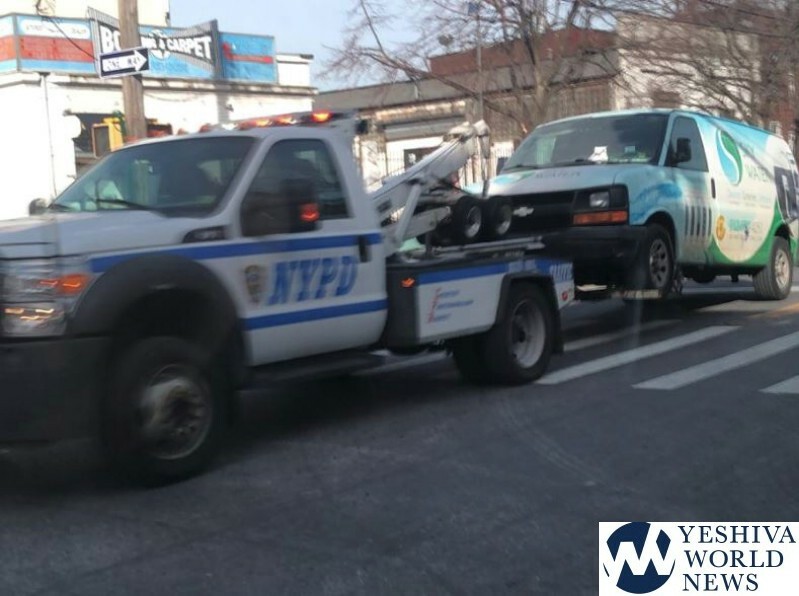 YWN attempted to confirm if this was the case, and has been told that tow trucks have been coming to Boro Park for quite a few weeks, and this has nothing to do with last week’s unfortunate incident. 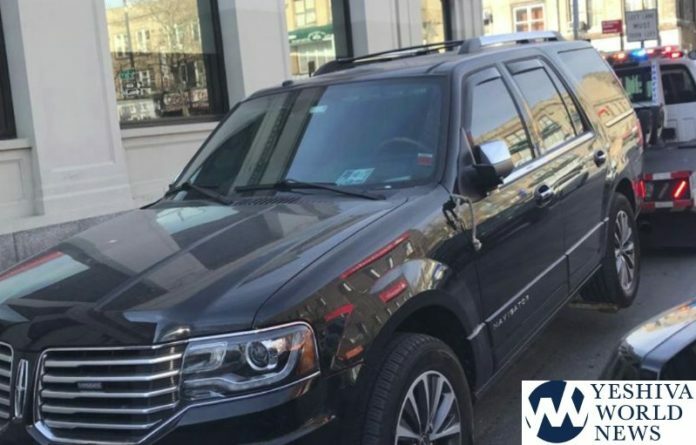 The incident last week was reported with lots of “fake news” by many mainstream news agencies, as they falsely claimed that the driver of the vehicle that fled authorities was a member of Boro Park Shomrim. This was 100% false. In fact, YWN has confirmed that this fake information was deliberately spread online by a fringe group of hateful people in the Boro Park Community. Many in the community were rightfully outraged by the few bystanders that caused a colossal chillul hashem by degrading this Traffic Agent, and a joint statement was released on Twitter by Misaskim publicly apologizing for the way the driver was treated. The driver was arrested on Monday. Headline should start: DOING THEIR JOB? I do not know the exact circumstances of these situations, so I cant comment on them. However, I would like to address when people are extremely inconsiderate and double park. Do you not realize how much traffic this causes to everyone else around you? Do you only care about yourself without any regard for how this effects everyone else? I would encourage the NYPD to tow every single vehicle that double parks causing massive amounts of traffic. Anonimity86 , Agreed. With all honesty, my first thought was what illegal spots did these cars park in this time. Parking in a No Parking lane, hydrant, bus stop means ‘NO PARKING’. Not for a minute to run upstairs to get something, not for an hour for shopping, not for the duration of Mincha. Can’t find a spot before minyan starts? Leave earlier, walk, or daven at home! Just like the campaigns of no talking in shul, there should be a zero tolerance of illegal parking in order to attend minyan policy. Yes, I think towing a car is extreme. Can they lawfully tow a car in such a situation? Yes. We should be happy the the NYPD is lawfully enforcing the rules and regulation created to keep our streets safe and efficient. No. This all boils down to the very attitude behind violations. There is no consideration for the drivers as well. Anyone saying otherwise, never owned a vehicle/drives in Brooklyn. Its enough the large enough $ amount that they collect – when they tow your car its a major hassle and cost for anyone out there. While there are many people struggling to pay their bills in NY, obtaining your car will cost you all the extras they slap on you (storage fee, taxes, towing fee etc) PLUS a full day of work. Its unfortunate that the guy was on top of that arrested, (thanks to the geniuses that added fuel and posted it) when all he did was park on an illegal ‘border line’ and wasn’t even blocking traffic. Cops don’t want get shot. if we think it’s “our place”(as was heard on the clip) then we are saying that were are not in גלות, so we will be reminded by our neighbors that we should be thankful for letting us stay in “their place”. It’s too bad these guys were all parked illegally because now Hikind can’t cut a promo on Ocean Pkwy about how the city is targeting honest, law abiding yidden. NY is becoming increasingly difficult and uncomfortable to live in. Add the high taxes, the new education regulations, the mayor and governors’ progressive agenda and its a recipe for disaster. In this case, I highly doubt this is the practice in other areas of the city. This is pure and simple evil. Bp is run like the wild west when it comes to illegally parking among other things. Bring normalicy back firt a change and tow all illegally parked cars,trucks and school buses To the impound. Tickets from nypd dont help because the drivers contact the “heimishe tickt fixrs” to void the tickets. Perhaps this will bring an end to the flagrant illegal parking ion Boro Park, much of which endangers the residents. Ambulances have trouble negotiating double parked streets. Crosswalks and fire hydrants are frequently blocked. Enforcement is not about revenue but an end to the lawlessness actually benefits the majority of residents. The driver was arrested on Monday. Does his offence carry Jail time? or/& revocation/suspension of his driving license? or/& a fine? Given that they had his info. from his car license, they could have already arrested him prior to onset of Shabbos rather than a Monday, but he may get less lucky with ensuing Shabbos. I think the majority of CR readers will agree that more aggressive enforcement of the parking rules in Brooklyn and other parts of the City is long-overdue. The problem is that the fines and fees for being towed are relatively low and for a few hundred dollars, many will take the risk of parking illegally and blocking others or restricting the ability of first-responders to do their job. I do not support illegal parking. But the discussion of this is incomplete without addressing the fact that there is a shortage of parking spaces, and that there needs to be a campaign (not a campaign promise) to open up more spaces. Hydrants do not need 30 feet of space, and most bus stops cover almost entire blocks in BP. There are shuls that have huge no parking zones. Wedding halls that have valet parking have vast amounts of space blocked for no valid reason. Before Yomim Tovim of Pesach and Sukkos, as well as other times of the year, There are many dozens of containers that block 3 or more spaces each for stores to display additional merchandise or for storage. This is grossly unfair, and compels people to park illegally. Open up more parking with some simple changes. It is high time BP Jews are subjected to the same laws, rules and regulations as the rest of us living in Flatbush, Kew Gardens, etc. Hopefully the Reichberg Rechnitz buying off city cops era has ended in BP. GAON, there is no such thing as a “borderline” treif sandwich. It’s either kosher or treif meat in the sandwich. With the parking, it’s either legally or illegally parked. A simple response to all your comments about unfairness, Gotcha attitudes, and financial expenses is PARK LEGALLY. Park in your privately owned driveway, park in a legal street spot, feed the meter appropriately, no double parking, no nivel peh or chillul Hashem when a parking agent approaches you or your car. Those are some great ideas to start! Parking is an enormous challenge in bp. The subways and buses don’t help this situation. Bike riding, even 3 wheelers is unsuitable for sidewalk congestion and weather. California is using electric scooters everywhere, not an answer for older folks. How about trams and public parking facilities in bp. Tickets only create revenue and cost, how about some real solutions. The car last week also owed more then $1000. I am not defending the very ticketing, rather, the very motion of “towing” a car that was not blocking any traffic. Legal parking is not the issue, the issue is there IS NO parking in Brooklyn (personally, I avoid BP as much as possible). The Traffic cop should have been more considerate. The crime needs to fit the punishment, and when Traffic agents start measuring your exact space etc and towing that is troubling. When the very attitude of the Law is not for the benefit its citizens but, rather revenue, then we have a major issue! To those that say that there is not enough parking: There is a sickness of many boro park (flatbush too), that they must park in front of the store that they are going to. Chas vesholom that any of these fat szhlobs should park a block away and *GASP*, walk! Sadly, I am now seeing the same behavior in Monsey. The stores have parking lots, but these same schmos that moved here have no qualms about parking in handicapped spots of just standing in the fire zone in front of the stores. Will anything happen if they just parked and walked from/to the car? Perhaps they might burn a few calories. Stop signs? Red lights? Merely suggestion. Does not apply to my new tuna beigel neighbors. And the way they drive, insane. PS to “the little i know”, the only way to get more parking is to tear down a few building and build multi level municipal parking (lie Maimonides is doing). BUT…. that means the lazy bums would have to walk a bit. I personally avoid Boro Park at all costs due to the headaches of getting around. The inconsiderate drivers are a big problem. Gaon, the driver had a substantial amount of unpaid fines, which is why he was towed. Can someone [YWN] please explain on what grounds he was arrested for? Obstruction? All this crying and shrieking about the parking in Brooklyn and how terrible it is. Nobody’s forcing you to live in Brooklyn, or in New York for that matter. There’s no mitzvah to live there. the cost of living in NYC: high taxes, high gas prices, high fines (even for minor infractions), high crime (thanks Bill! ), the risk of getting your car sideswiped on a random street just because the light was about to turn red, high housing costs, highly paid government union workers, high tolls, anti-religious politicians and bureaucrats, and now because of the above mentioned over-paid government unions and high fines for small infractions, if you don’t take care of outstanding fines your car will be towed as well. again, I am not recommending that you avoid paying your fines, I am just wondering why anyone still lives in that nearly Godless city(I say nearly, not entirley, because of neighborhoods like BP, Flatbush, Lower East Side, Yeshiva Staten Island etc.). Stop wondering why anyone lives in NYC, for starters, this is where it’s happening; where most of the nation’s top yeshivas are located, where most of the nation’s gedolei hador, poskim, rabbonim and mosdos are located. Another Chillel Hashem concerning vehicles: private cars with Hatzallah placards going through red lights and parking anywhere they want (including areas reserved for the handicapped) during non-emergencies. This includes wives and family members of Hatzallah volunteers. There is unlawful and there is no valid excuse. They can and will rationalize it and even make it into a mitzvah to do these illegal activities. Cherrybim, don’t kid yourself. There’s no NYC mentioned anywhere in Tanach.